This is the land of opportunity. All of these first or second generation immigrants had a vision and an entrepreneurial spirit which enabled them to leave their legacy to this great country. This is the land of opportunity. If you can dream it, you have a chance to make it come true. Like all of those who came before me, including my parents, I have a chance to make my mark in this great country. The legacy I choose to leave behind is to help as many foreign nationals as possible achieve the American Dream so they can make this country a better place for future generations. At Legacy Immigration, our vision is to help every foreign national overcome immigration-related obstacles so they can fulfill their dream of coming to the United States of America. It is our hope that each and every foreign national avails themselves of this country’s opportunities to flourish and ultimately leave their own legacy that benefits future generations. Our mission is to provide superior legal services with uncompromising dedication and the highest ethical standards. To this end, we advocate zealously using client-specific facts to overcome complex or routine immigration problems. We strive to always produce work product that is tantamount to legal excellence while maintaining integrity, professionalism and respect for our clients. EXCELLENCE. We endeavor to become one of the most desirable immigration law service providers in the region. SERVICE. We strive to exceed the expectations of our clients in all aspects of their legal representation. EDUCATION. We foster learning relationships among colleagues to encourage the common sharing of knowledge within the greater legal community. COMMUNITY. 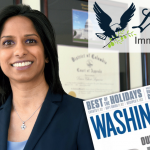 We communicate our legal expertise with the local community to promote the education and understanding of immigration law. CHARITY. We share the belief that giving back to the community outside of the practice of law is of paramount importance since it fosters a sense of family and community.